Short Sale Sellers are BACK!!!! Exccellent! More than 7 million homeowners who suffered a foreclosure or short sale during the housing crisis are poised to become buyers again. Over the next eight years, nearly 7.3 million Americans who lost their homes in the housing crash will become creditworthy enough to buy again, according to a new analysis. RealtyTrac, a real estate information company and online marketplace for foreclosed properties, estimates that these “boomerang buyers”—those who suffered a foreclosure or short sale between 2007 and 2014—are rapidly approaching, or already past, the seven-year window “conservatively” needed to repair their credit. This year, the firm expects, more than 550,000 of these buyers could be in a position to get back into the market. The number of newly creditworthy individuals will then top 1 million between 2016 and 2019 and gradually decline to about 455,000 in 2022. Based on those criteria, the analysis targets metro areas surrounding Phoenix (with an estimated 348,329 potential boomerang buyers), Miami (322,141), and Detroit (304,501) as the most likely to see an uptick in return buyers. Chris Pollinger, senior vice president of sales at First Team Real Estate, told RealtyTrac that previously foreclosed Americans shouldn’t rule out another try at homeownership. “The housing crisis certainly hit home the fact that homeownership is not for everyone, but those burned during the crisis should not immediately throw the baby out with the bathwater when it comes to their second chance,” Pollinger said. The overall U.S. housing market still is struggling to hit its stride, but the remodeling market meanwhile has fully regained its mojo, according to a report released Thursday by the Harvard University Joint Center for Housing Studies. Kermit Baker, director of the center’s remodeling futures program, forecasts that spending in the U.S. remodeling market will grow by 4% to 5% this year to at least $330 billion, spanning work on both owned homes and rentals. That’s a slower growth rate than in previous years of the recovery, but it would be enough to make 2015 the richest year for remodeling spending of the past 15, surpassing the previous high point of $324 billion in 2007. “The market is largely recovered,” Mr. Baker said. “It will resume growth at its historical level, which has been (an average of ) just about 5% year over year for the past 30 years.” The main reason: A similar easing of home-price appreciation. The median resale price of existing homes last month of $209,500 marked a 6% increase from a year earlier. In comparison, the increase in 2013 was nearly 10%. Homeowners are less likely to push ahead with an ambitious, pricey renovation if their home equity isn’t growing as rapidly anymore. Another factor sapping a bit of momentum from the robust remodeling market is that homeowners don’t have as much motivation now as they did in previous years to install energy-efficient windows, doors and other features in their house, Mr. Baker said. Part of that is because federal tax credits for such improvements have waned. An additional influence is that energy costs, particularly for gas for heating homes, have declined markedly in recent months. 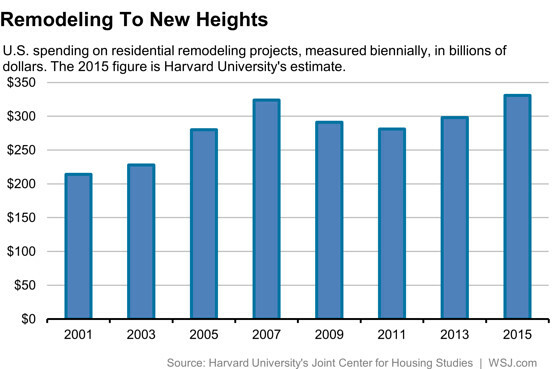 Still other factors will have the opposite effect, keeping remodeling spending from reversing course. Mr. Baker notes that more baby boomers are remodeling as they opt to stay in their long-time homes and equip them with handrails, elevators, first-floor bedrooms and other aging-in-place features. Meanwhile, the remodeling market has listed in recent years toward bigger-ticket, discretionary jobs, including kitchen and bathroom upgrades. The share of overall remodeling spending attributable to such discretionary projects accounted for 30% of remodeling spending on owned homes in 2013, up by roughly a percentage point from 2011, Mr. Baker said. He anticipates that share will continue to grow this year, though he hasn’t forecast a specific percentage. The increase in discretionary remodeling is mostly due to home price appreciation since 2012, Mr. Baker said. Mr. Baker compiled his figures on remodeling spending based on data from the Commerce Department, the Department of Housing and Urban Development and Harvard research. Anthony Carrino, a partner in Jersey City, N.J., contractor Brunelleschi Construction and a host of remodeling shows on Scripps Networks Interactive’s HGTV network, says he has seen customers spending more ambitiously in the past year. On the other coast, Michael Grosswendt, owner and president of Big & Tall Construction Inc.’s All Coast Construction, said he’s too busy to bid for all the jobs he is invited to pursue. Mr. Grosswendt’s 28-employee company specializes in big jobs of $5 million to $20 million in the Los Angeles area. Many of his clients of late are foreign homeowners looking to put more money into their U.S. properties due to the more-stable U.S. dollar and economy. A just-released analysis shows that nearly 950,000 homes returned to positive equity in the second quarter of 2014, bringing the total number of mortgaged residential properties with equity in the U.S. to more than 44 million. Nationwide, borrower equity increased year over year by approximately $1 trillion in Q2 2014. The report from CoreLogic®, provider of global property information, analytics and data-enabled services, also indicates that approximately 5.3 million homes, or 10.7 percent of all residential properties with a mortgage, were still in negative equity as of Q2 2014 compared to 6.3 million homes, or 12.7 percent, for Q1 2014*. This compares to a negative equity share of 14.9 percent, or 7.2 million homes, in Q2 2013, representing a year-over-year decrease in the number of homes underwater by almost 2 million (1,962,435), or 4.2 percent. Negative equity, often referred to as “underwater” or “upside down,” means that borrowers owe more on their mortgages than their homes are worth. Negative equity can occur because of a decline in value, an increase in mortgage debt or a combination of both. For the homes in negative equity status, the national aggregate value of negative equity was $345.1 billion at the end of Q2 2014, down $38.1 billion from approximately $383.2 billion in the first quarter 2014. On a year-over-year basis, the value of negative equity declined from $432.9 billion in Q2 2013, representing a decrease of 20.3 percent in 12 months. Of the 44 million residential properties with positive equity, approximately 9 million, or 19 percent, have less than 20-percent equity (referred to as “under-equitied”) and 1.3 million of those have less than 5 percent (referred to as near-negative equity). Borrowers who are “under-equitied” may have a more difficult time refinancing their existing homes or obtaining new financing to sell and buy another home due to underwriting constraints. Borrowers with near-negative equity are considered at risk of moving into negative equity if home prices fall. In contrast, if home prices rose by as little as 5 percent, an additional 1 million homeowners now in negative equity would regain equity. Nevada had the highest percentage of mortgaged properties in negative equity at 26.3 percent, followed by Florida (24.3 percent), Arizona (19.0 percent), Illinois (15.4 percent) and Rhode Island (14.8). These top five states combined account for 32.8 percent of negative equity in the United States. Texas had the highest percentage of mortgaged residential properties in an equity position at 97.3 percent, followed by Alaska (96.5 percent), Montana (96.4 percent), North Dakota (96.0 percent) and Hawaii (96.0 percent). Of the 25 largest Core Based Statistical Areas (CBSAs) based on population, Tampa-St. Petersburg-Clearwater, Fla., had the highest percentage of mortgaged properties in negative equity at 26.2 percent, followed by followed by Phoenix-Mesa-Scottsdale, Ariz. (19.5 percent), Chicago-Naperville-Arlington Heights, Ill. (17.9 percent), Riverside-San Bernardino-Ontario, Calif. (15.4 percent) and Atlanta-Sandy Springs-Roswell, Ga. (15.3 percent). Of the largest 25 CBSAs based on population, Houston-The Woodlands-Sugar Land, Texas had the highest percentage of mortgaged properties in an equity position at 97.5 percent; followed by Dallas-Plano-Irving, Texas (97.0 percent); Anaheim-Santa Ana-Irvine, Calif. (96.4 percent); Portland-Vancouver-Hillsboro, Ore. (96.1 percent) and Seattle-Bellevue-Everett, Wash. (95.4 percent). Of the total $345 billion in negative equity, first liens without home equity loans accounted for $180 billion aggregate negative equity, while first liens with home equity loans accounted for $165 billion. Approximately 3.2 million underwater borrowers hold first liens without home equity loans. The average mortgage balance for this group of borrowers is $227,000. The average underwater amount is $57,000. Approximately 2.1 million underwater borrowers hold both first and second liens. The average mortgage balance for this group of borrowers is $297,000.The average underwater amount is $77,000. The bulk of home equity for mortgaged properties is concentrated at the high end of the housing market. For example, 94 percent of homes valued at greater than $200,000 have equity compared with 84 percent of homes valued at less than $200,000. *Q1 2014 data was revised. Revisions with public records data are standard, and to ensure accuracy, CoreLogic incorporates the newly released public data to provide updated results. The Great Recession of 2007 caused the once-prolific American shopper to go into a prolonged scrimp mode. Now, some seven years later – and more than five years after the recession officially ended - the tide has turned, according to a new Consumer Reports study. A nationally representative survey of 1,006 adult Americans conducted by the Consumer Reports National Research Center revealed that people are now in the market for major purchases like homes, cars, and appliances – and that they plan to spend even more money in the coming year. The full report, "How America Shops Now," is the cover story for the November 2014 issue of Consumer Reports magazine and is available on newsstands now and at ConsumerReports.org. "Shoppers may be back, but they're far from the profligate spenders they used to be. The harsh lessons of the prolonged downturn have had a major impact, perhaps a permanent one," says Tod Marks, senior projects editor for Consumer Reports. "Our survey shows that Americans are spending their money very pragmatically, and even though the employment picture has improved, many are working scared – scared about their future job stability and earnings outlook." 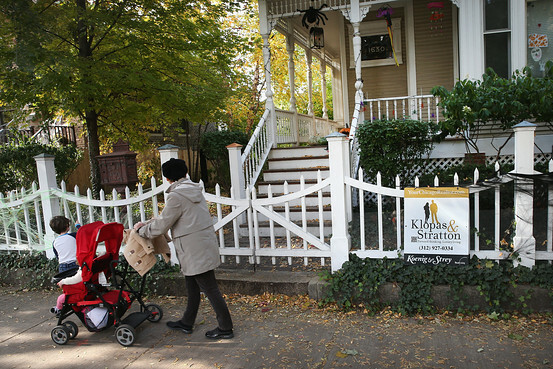 Is 2015 the Turnaround Year for First-Time Home Buyers? The share of first-time home buyers has represented less than 30% of all buyers in 18 of the last 19 months, according to the National Association of Realtors. First-time home buyers only made up 29% of sales of previously owned homes in October, the National Association of Realtors said Thursday. The share of those buyers has represented less than 30% of all buyers in 18 of the last 19 months, the trade group said. But chief economist Lawrence Yun said 2015 could mark a turnaround. Factors that would encourage first-time buyers to enter the market are “developing positively” now, he added, pointing to stronger job creation, underwriting standards that have been “dialed down,” and the return of mortgage products that allow buyers to only put down 3% and pay mortgage insurance. Could Decline in Median New-Home Size Herald Return of Entry-Level Buyers? In the realm of mortgages backed by Fannie Mae and Freddie Mac, California tends to fall into two categories -- high-cost counties where eligible single-family home loans can't be higher than $625,500 (Los Angeles, Orange) or those with the standard limit of $417,000 limit (Riverside, San Bernardino). It's the old coastal versus inland divide, for the most part, as in San Francisco at a $625,500 loan max and San Joaquin at a $417,000 limit. Some counties fall in between, including San Diego, Ventura, Monterey and Napa. And those four, along with 42 other counties across the nation, will see their upper limits for Fannie and Freddie loans increase in 2015 as a result of rising home prices. Napa at $615,250, up from $592,250. Ventura at $603,750, up from $598,000. Monterey at $502,550, up from $483,000. The FHFA also released an updated list of the 2015 limits for every area of the country. Fannie and Freddie keep housing finance going by buying bundles of loans from lenders, written to conform to rules including the size limits. They use the loans to back mortgage securities, guaranteeing payments to bond investors if the borrowers default. About 60% of the mortgages written in the United States are backed by Fannie and Freddie, with the government also guaranteeing large numbers of Veterans Administration and Federal Housing Administration loans. This will only serve to drive more price disparity between the coastal cities and the inland cities. The best thing to do would be to keep the limit at $417K for all areas. Much of California's housing is so expensive that affluent buyers get loans not from those sources but from lenders offering outsized loans known as jumbos. In recent years those lenders have mainly been banks that keep the loans on their books as investments. Competition to provide jumbos to high-net-worth individuals has become so intense that, in a reversal of the usual state of affairs, jumbo mortgages sometimes have lower interest rates these days than loans backed by Fannie and Freddie. Wells Fargo & Co. the nation's largest home lender, on Monday was advertising conforming 30-year fixed-rate loans to purchase houses at 4.125% annual interest. The rate was just 4% for purchase-money jumbo mortgages with the rate fixed for 30 years. Richard Cirelli, a mortgage broker in Laguna Beach, said rates on conforming loans and jumbos are comparable for loans of up to $1 million for an owner-occupied single-family home purchase or refinance. However, Cirelli noted that other factors make conforming loans preferable for many borrowers. Allowable credit scores and down payments are lower on conforming loans than for jumbos, and it’s easier and cheaper to finance two- to four-unit properties or to cash out equity when refinancing a home, he said. LOS ANGELES (Oct. 7) – With more available homes on the market for sale, California’s housing market will see fewer investors and a return to traditional home buyers as home sales rise modestly and prices flatten out in 2015, according to the CALIFORNIA ASSOCIATION OF REALTORS®’ (C.A.R.) “2015 California Housing Market Forecast,” released today. Appleton-Young will present an expanded forecast Thursday afternoon during CALIFORNIA REALTOR® EXPO 2014, running Oct. 7-9 at the Anaheim Convention Center in Anaheim, Calif. The trade show attracts nearly 8,000 attendees and is the largest state real estate trade show in the nation. Leading the way...® in California real estate for more than 100 years, the CALIFORNIA ASSOCIATION OF REALTORS® (www.car.org) is one of the largest state trade organizations in the United States, with more than 165,000 members dedicated to the advancement of professionalism in real estate. C.A.R. is headquartered in Los Angeles. LOS ANGELES (Oct. 22) – California home sales remained steady in September, as home price gains eased back from an unusually high increase in August, the CALIFORNIA ASSOCIATION OF REALTORS® (C.A.R.) said today. Closed escrow sales of existing, single-family detached homes in California totaled a seasonally adjusted annualized rate of 396,440 units in September, according to information collected by C.A.R. from more than 90 local REALTOR® associations and MLSs statewide. Sales in September inched up 0.4 percent from a revised 394,700 in August and were down 4.2 percent from 413,850 in September 2013. September marked the 11th straight month that sales were below the 400,000 level and the 14th straight month that sales have declined on a year-over-year basis. The statewide sales figure represents what would be the total number of homes sold during 2014 if sales maintained the September pace throughout the year. It is adjusted to account for seasonal factors that typically influence home sales. The median price of an existing, single-family detached California home fell 4 percent from August’s median price of $480,280 to $460,940 in September but was up 7.6 percent from the revised $428,290 recorded in September 2013. The statewide median home price has been higher on a year-over-year basis for more than two years. The median sales price is the point at which half of homes sold for more and half sold for less; it is influenced by the types of homes selling as well as a general change in values. • Housing inventory inched up higher in September, with the available supply of existing, single-family detached homes for sale increasing from 4 months in August to 4.2 months in September. The index was 3.6 months in September 2013. The index indicates the number of months needed to sell the supply of homes on the market at the current sales rate. A six- to seven-month supply is considered typical in a normal market. • The median number of days it took to sell a single-family home rose in September, up from a revised 38.5 days in August to 39.2 days in September and from a revised 29.8 days in September 2013. • Mortgage rates rose slightly in September, with the 30-year, fixed-mortgage interest rate averaging 4.16 percent, up from 4.12 percent in August but down from 4.49 percent in September 2013, according to Freddie Mac. Adjustable-mortgage interest rates in September were also up, averaging 2.43 percent, up from 2.37 percent in August but down from 2.67 percent in September 2013. • September sales at-a-glance infographic. • Unsold Inventory by price range. • Change in sales by price range. • Share of sales by price range. Note: The County MLS median price and sales data in the tables are generated from a survey of more than 90 associations of REALTORS® throughout the state, and represent statistics of existing single-family detached homes only. County sales data are not adjusted to account for seasonal factors that can influence home sales. Movements in sales prices should not be interpreted as changes in the cost of a standard home. The median price is where half sold for more and half sold for less; medians are more typical than average prices, which are skewed by a relatively small share of transactions at either the lower-end or the upper-end. Median prices can be influenced by changes in cost, as well as changes in the characteristics and the size of homes sold. Due to the low sales volume in some areas, median price changes in September exhibit unusual fluctuation. 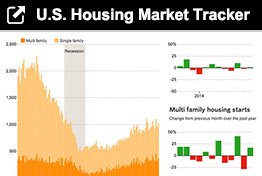 The change in median prices should not be construed as actual price changes in specific homes. Leading the way…® in California real estate for more than 100 years, the CALIFORNIA ASSOCIATION OF REALTORS® (www.car.org) is one of the largest state trade organizations in the United States with 165,000 members dedicated to the advancement of professionalism in real estate. C.A.R. is headquartered in Los Angeles.